ndb_binlog_index may require additional disk space after being converted to InnoDB. If this becomes an issue, you may be able to conserve space by using an InnoDB tablespace for this table, changing its ROW_FORMAT to COMPRESSED, or both. For more information, see CREATE TABLESPACE Syntax, and CREATE TABLE Syntax, as well as Tablespaces. See Section 8.8, “Implementing Failover with NDB Cluster Replication”, for more information about using the next_position and next_file columns. 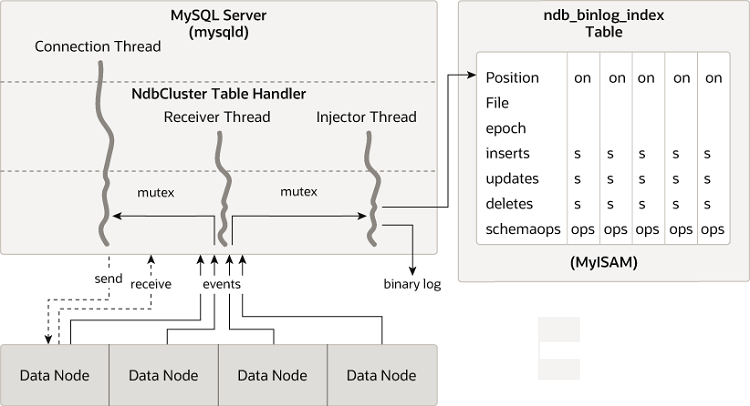 Conflict resolution for NDB Cluster Replication requires the presence of an additional mysql.ndb_replication table. Currently, this table must be created manually. For information about how to do this, see Section 8.11, “NDB Cluster Replication Conflict Resolution”.